20 x 40 yard zone. Cones in pairs as gates. Size of zone and number of gates can be adjusted based on number of players. All players with ball. 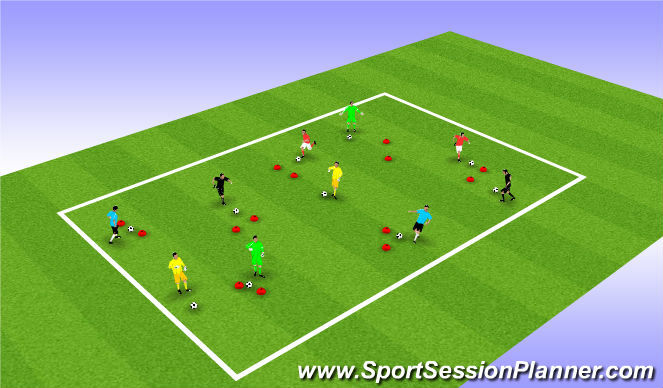 Players free-form dribbling in zone. Add progressions to introduce turning. Lift head when running to avoid bumping into other players/touching cones. P - Add competition - how many gates can player get through in 60 seconds? P - Red/green/yellow light - When coach says &apos;green light&apos; players dribble as fast as they can. When coach says &apos;red light&apos; they stop and do 10 toe taps. When coach says &apos;yellow light&apos; they dribble at normal speed. 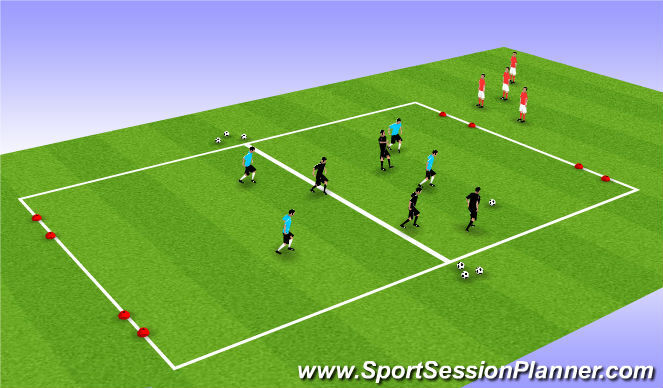 P - Players have to dribble through cones, turn and dribble back through same cone. 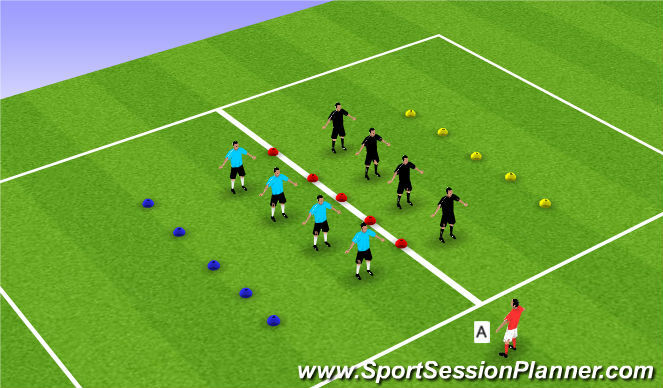 Three lines of cones.Players in pairs standing opposite each other and either side of center line of cones, facing coach at A. Coach has pinnies matching color of cones on outside of grid. Coach calls out multiple levels of player vs player challenges. Players start by touching cleat to cleat. Coach calls color of cone players need to run to. Player closest to that color cone trys to run to it before partner tages them. - see progressions. Ball control - ball close to foot. P - Players on one knee. P - Players on two knees. P - Players lay down. P - Players run to opposite side than the one called by coach. P - Coach holds up pinnie that is color of cone players run to. P - Coach holds up pinnie that is color of opposite cone players run to. P - Add ball, repeat all progressions. P - Both players in pair dribble to the cone on their side - first back wins. 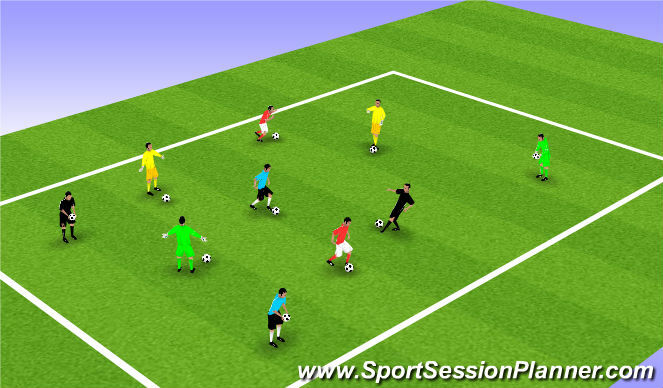 P - Both players in pair dribble to the cone on their side and back 5 or 10 times - first back wins. P - Both players in pair dribble to the cone on their side and back 5 or 10 times with specific turn instructed by coach - first back wins. 40 x 20 yards. Two goals in center of zone facing out. Players in two teams at opposite ends of zone. Coach on side at C with lots of soccer balls. Four coned gates in corners of zone at D.
Coach serves soccer ball in and players play 1 v 1 to get ball to opposite goal - Players from A have to score in goal at A. Players from B have to score in goal at B.
P - Vary ball distribution technique - bounce, throw high, send one one specific side, drop short. P - Add competition - create teams and keep score, first team to 5, 10 goals. P - Goal worth two if player dribbles through cone gate at D.
30 x 70 area set up as shown. Open play. 8 - 16 players, 4 v 4 or adjust based on number of available players. When a team concedes they are replaced by four team mates. Create triangles: 2 v 1 and 3 v 2 overloads. Creativity esp use of turns. P - Goal worth 2 points if player gets ball into oppostion half, back into own half then again into oppostion half.